We got going by 7:45am this morning. It was still cold, but we could tell it would finally be a warm day once the sun was high enough to warm the canyon. 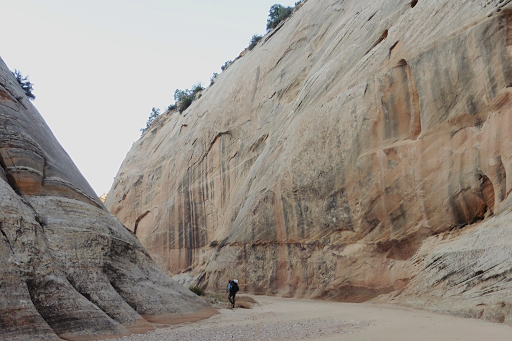 We had about 14mi of Hackberry Canyon to go down. 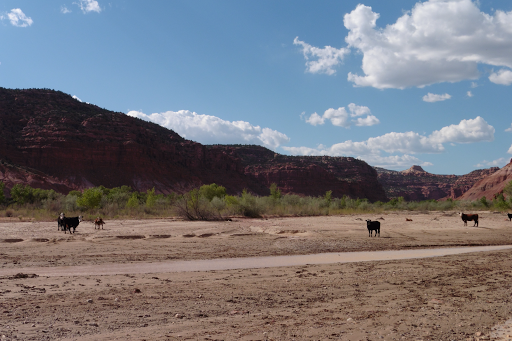 The first couple hours of the morning, the canyon was dry and sandy. It wasn’t too wide and I liked the rock walls on each side as it curved. The sand was fine and damp, (possibly unique given the recent precipitation) so it was easy walking. With the ripples in the sand and abundance of smooth stones and pebbles of various shapes and colors, I felt like I was on the beach of an ocean with no water. Katherine has had a bit of a nagging knee that swells from time to time. Nothing that would stop a hike, but something she wants to be careful not to over stress so she can enjoyably return to dance (which she loves) when the hike is over. We have ~60mi left and with the pattern of 20+mi days we’ve had, there’s a chance of making town in three days. Katherine is thinking of either taking it easy and stretching it to four days or possibly taking a zero in town to rest the knee. We discussed it and since it’s all unpredictable and dependent on how the knee feels, I’m going to just do my pace to town (probably in 3 days) and then we’ll check in with each other in town(Tropic). 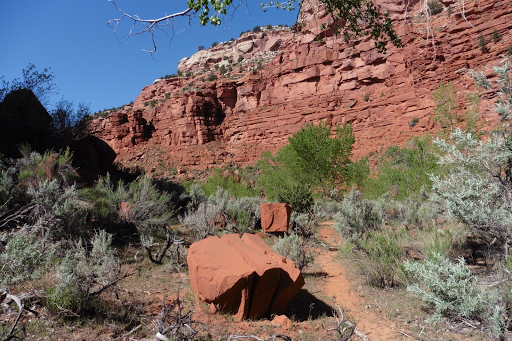 My laptop is in the next town(Kanab) just four days after Tropic with someone who offered to host me, so I may just hike on to Kanab and take a lot zero with my laptop until Katherine catches up…or we may end up hiking separately. We are just going to play it by ear. 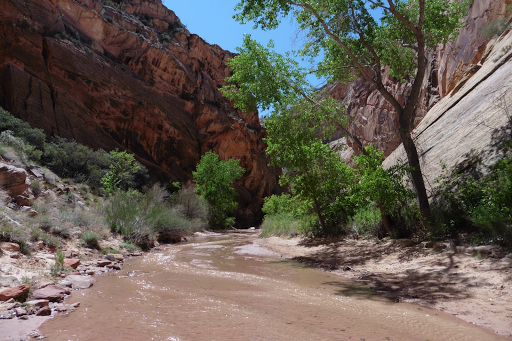 So, mid morning, we split at a spot where Katherine wanted to check out a side trip to a technical slot canyon called Stone Donkey Canyon. 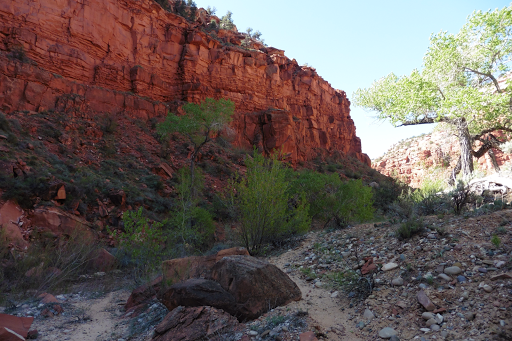 As I hiked the remaining miles to the end of the Hackberry Canyon, it got narrower and changed completely with more foliage, a solid stream, and reddish colored rock all around. It is Saturday, so there were tons of day hikers coming in from the trailhead. 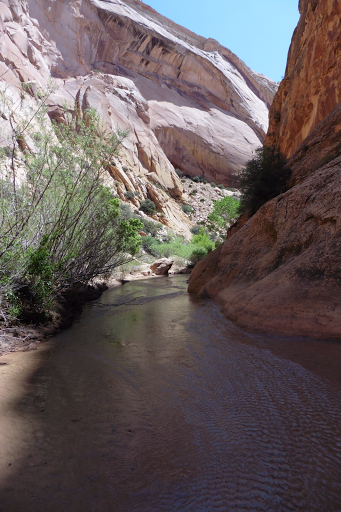 By the last few miles, there was no point in dodging the water as the trail became the water and I just hiked in the stream, which was just a couple inches deep most of the time. It was really nice and I recommend it as a nice unique day hike. I had lunch at the trailhead and 30mins into my lunch Katherine arrived and was also planning to have lunch there. We were shocked that we had done over 14mi by lunch and still had half the day of hiking left. Katherine was trying to slow down, but apparently can’t help it, ha! The knee was ok, but her plan was to stop early if it got aggravated the second half of the day, which is what’s been happening. I packed up and hiked on, this time knowing we probably won’t see each other again until town. 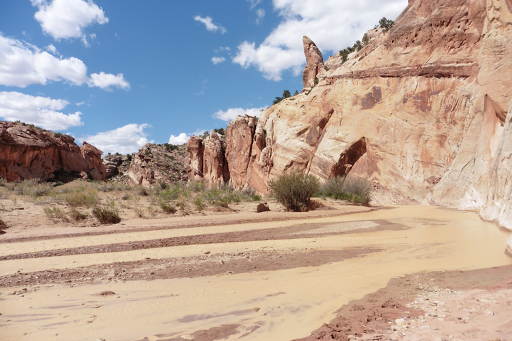 I was excited to get a 3mi dry road walk to the next canyon and soon realized that the map suggested the road as an option, but the was an actual trail along a creek, so I cut back over and took the trail. 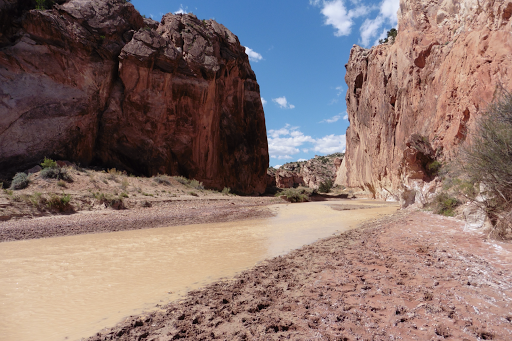 The rat of the day was spent hiking up the Paria River which looks like chocolate milk. It was wide and wound a lot, so I had to cross it all afternoon. At least it was shallow and warm enough to have shorts on. 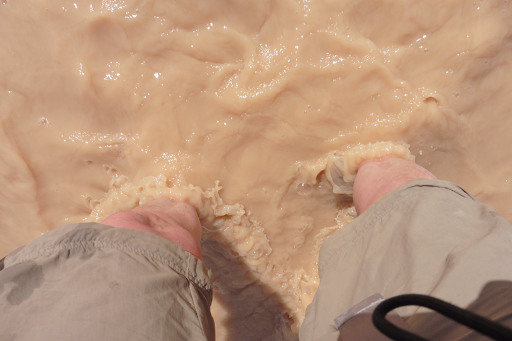 There wasn’t any quicksand, but there was a lot of that claylike mud that can make things slow. 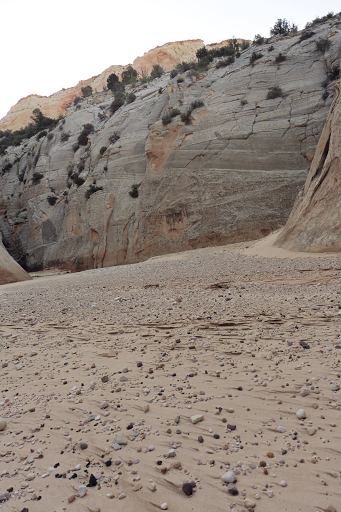 I was able to find harder packed clay or sand much of the time, but I this terrain is not great for Katherine’s knee. I have my ankle brace on for the third day in a row and will probably wear it the rest of this leg. It got irritated with the heavy loads at the start of the leg a few days ago and is improving, but still sore, so I’ll give it the brace for a few days. There were tons of cows and I couldn’t bring myself to drink that water. I tried to get some cleaner water from side streams marked as possible sources on the map, but they were either dry or just as murky. I went a bit later than I would have liked and hiked until I found a pothole of water that somehow wasn’t so silty at 6:50pm. It had been a big mile day (27mi!) and I immediately setup camp nearby happy with the progress. 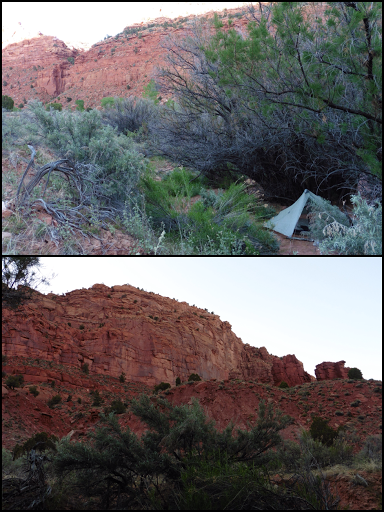 I got a great spot again protected by some pesky tamarisk and I have a nice view with the red rock cliffs around me. This has definitely got to be the biggest of the trip for me since but miles generally don’t happen on the Hayduke. I really think the map must be wrong as I don’t feel like I did that many miles. I would have guessed a few miles less, but Katherine has the GPS that runs all day to track log the hike, so I couldn’t compare today. I’m starting to fall asleep, but I will comment a bit on hiking solo today since it’s the first day solo this hike. It’s something I’m comfortable with and so is Katherine. I find it refreshing and enjoy the independence of it. It’s nice to get some days to be on my own again. For the Hayduke, I feel comfortable going solo, but my opinion is that having someone to share the Hayduke with definitely makes it more enjoyable for me. Having said that, Katherine really likes the solitude of her hikes and I’m happy she can get this time since she doesn’t get out on long hikes each year like I do. She probably prefers hiking solo and that may be her decision once we reach town. Nothing to do with our pairing, just her preference and something we both knew coming into this. I don’t want her to look back and wish she’d had more of that solitude she enjoys so much. We’ve been open about that and may end up doing this second half separately. For now, just these few days to Tropic and then we will reassess.